PITTSBURGH & CHICAGO--(BUSINESS WIRE)--Kraft celebrates everyone’s right to family their way, including the dads who tell “knock-knock” jokes at the dinner table. And while cheesy dads may not be perfect, they’re always great. What better way to commemorate dad’s cheesy greatness than with his very own cheese sculpture? 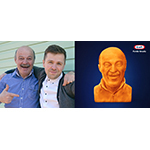 Starting today, Kraft is offering the ultimate last-minute Father’s Day gift: a limited number of custom-made cheese sculptures made from a block of Kraft Sharp Cheddar Cheese sculpted into his likeness. For a chance to gift your dad his own cheese sculpture, visit www.ebay.com/CheeseYourDad on June 11 and 12 to place a bid. Only five cheese sculptures are up for auction so place your bid now because the auction closes on June 12 at 5 p.m. CDT. Each Kraft cheese sculpture starts as a 40-pound block of Kraft Sharp Cheddar Cheese and is crafted with care. It takes three days from start to finish to make each sculpture, but the look on your dad’s face when you gift it to him this Father’s Day will be remembered for a lifetime. All proceeds from the Kraft Father’s Day auction will go toward Feeding America®, along with a dollar-for-dollar donation match from Kraft brand up to $25,000. Feeding America is the nation’s largest domestic hunger-relief organization, working to connect people with food and end hunger through a network of 200 member food banks. Share how you Family Greatly with your cheesy, but great dad this Father’s Day – take a photo and post it to social using #CheesyIsGreat and #FamilyGreatly. Don’t forget to tag and follow the Kraft Brand on Facebook, @KraftBrand on Twitter, and @kraft_brand on Instagram.